The STS-125 crew gets ready to attach their mission logo to the entrance into space shuttle Atlantis. 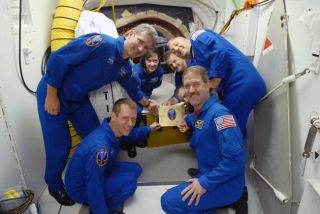 Clockwise from left front are: Pilot Gregory C. Johnson, mission specialists Michael Good and Megan McArthur, commander Scott Altman, and mission specialists Mike Massimino and John Grunsfeld. Thisstory was updated at 5:22 p.m. EDT. Aftermonths of delay, NASA?s space shuttle Atlantis is just one week away fromlaunching seven eager astronauts to give the iconic Hubble Space Telescope onelast makeover. Atlantis ispoised to rocket toward Hubble at 2:01 p.m. EDT (1801 GMT) on May 11 with a mixof veteran Hubble mechanics and first-time flyers on board. The mission, NASA?sfinalrepair flight to Hubble, has been delayed since October, when a criticalcomponent on the space telescope failed. ?We usedour time wisely with the slip to try and take ourselves up to another level,?said Atlantis skipper Scott Altman, who is leading the six-man, one-woman teamto the Hubble observatory. ?Now, we?re really looking forward to puttingall that practice into work.? Altman andhis crew plan to perform fiveback-to-back spacewalks during their 11-day mission to add new instruments,replace old batteries and gyroscopes and make vital repairs, including some toequipment that was never designed to be fixed in space. If all goes well, thework should extend the already 19-year-old Hubble telescope?s lifetime throughat least 2014. To be safe, NASA has primed a second space shuttle - theEndeavour orbiter - to serve as a rescue ship during the upcoming mission sinceAtlantis would be unable to reach the safe haven of the International SpaceStation from Hubble if it suffers critical damage. ?That?s oneof the things I haven?t been worried too much about,? Altman said, adding thathe considers the rescue mission as ?extremely unlikely.? LeadingAtlantis? charge to Hubble is Altman, a retired U.S. Navy captain making hisfourth spaceflight and second consecutive trip to the orbital space telescope.His last flight, STS-109 in 2002 aboard Columbia, was NASA?s most recent Hubbleservicing mission until now. Keepinghis crew fresh, especially in the face of months of delay after years of trainingfor a mission that NASA had initially cancelled because of the risk, has been agreat challenge, Altman has said. ?It hasbeen a struggle,? said Altman, 49, in a recent briefing. ?It?s made us, Ithink, appreciate this mission and the telescope even more.? Altmanhails from the town of Pekin, Ill., and joined NASA?s astronaut corps in 1995.He is an experienced test pilot who flies under call sign is ?Scooter? andjoined NASA?s astronaut corps in 1995. Altman is married to wife Jill and hasthree sons. Atlantispilot Gregory C. Johnson is actually one of two Greg Johnsons in NASA?sastronaut corps, but he goes by the call sign Ray Jay and moonlights as theHubble servicing crew?s social organizer. ?I guessI?m the social coordinator for the crew,? said Johnson, 54, who is making hisfirst spaceflight. ?We?ve had a lot of good parties at my house, each onebetter than the other?We?ve had a really good time.? LikeAltman, Johnson is a retired U.S. Navy captain and test pilot with a passionfor flying that led him to join NASA?s aircraft division in 1990 and latershift to the astronaut corps in 1998. He has flown high-performance aircraftoff Navy carriers and icy glaciers, but considers his trek into space as thepinnacle. ?I tellpeople it?s the greatest flying job in the universe. It?s going to be great,?Johnson, a Seattle, Wash-native, told SPACE.com. Johnson ismarried to wife Nanette and has five children, including two grown sons. U.S. AirForce colonel Michael ?Bueno? Good will make his spacewalking debut during thechallenging Hubble overhaul ahead after a nine-year wait to reach space. ?I?m ready,I?m really ready to go,? Good told SPACE.com. ?It?s been the best job ofmy life training to fly in space and we still have the whole flight ahead ofus.? Good, 46,is from Broadview Heights, Ohio and joined NASA?s spaceflying ranks in 2000. Anaerospace engineer and veteran test pilot, he will serve as Mission Specialist1 and participate in two of the five spacewalks to upgrade Hubble. He?s alreadybeen watching Hubble fly overhead from the driveway of his Houston home. ?I watch it go over and think about how cool that is,? Goodsaid. ?And then I imagine myself up there hanging on to the handrails of theHubble Space Telescope as it?s screaming across the sky and it really gets meexcited.? Good ismarried to wife Joan and has two sons, ages 23 and 19, and an 11-year-olddaughter. Without thedeft hand of astronaut Megan McArthur there could be no mission to Hubble.She?s in charge of catching Hubble with Atlantis? robotic arm so the telescopecan be hauled into the shuttle cargo bay for repairs. ?It shouldbe a simple operation and reaching out and grabbing the telescope,? saidMcArthur, 37, adding that it should be an exciting event. ?It will be my first,and probably only, time doing a free-flying grapple.? McArthurholds a doctorate in oceanography and joined NASA?s astronaut corps in 2000.For the Hubble mission she serves as Mission Specialist 2 and flightengineer during launch and landing, as well as the lead robotic arm operator.McArthur will make her first spaceflight on the mission. ?It?ll bethrilling for me to see the planet from space?the vastness of the ocean,? saidMcArthur, who was born in Honolulu, Hawaii, and grew up in California. ?I?mjust excited to take it all in, let it soak in, the beauty of our planet.? McArthur ismarried to fellow NASA astronaut Robert Behnken. Astronaut JohnGrunsfeld, 50, is no stranger to the Hubble Space Telescope. Theastronomer-turned-astronaut is making his fifth career spaceflight aboardAtlantis on a mission that marks his third visit to Hubble. He serves asMission Specialist 3 and the flight?s lead spacewalker, with three excursionson tap. ?The HubbleSpace Telescope ismore than remarkable,? said Grunsfeld, a self-labeled ?Hubble hugger,? in aNASA interview. ?It has answered just so many of those fundamental questionsthat people have been asking about the cosmos since people were able to askquestions.? Grunsfeldhas aimed for space since his childhood, when he built his own ad hoc spacesuitout of a vacuum cleaner and ice cream tins. He was born in Chicago, Ill., andobtained a doctorate in physics before realizing his astronaut dream in 1992. ?I thinkthat space exploration as abroad activity is the most important things thathumans can do,? Grunsfeld said in an interview. ?I?ve always found itfascinating, interesting, compelling and I have a drive to go out into space.? Grunsfeldis married to wife Carol and has two young children, a son and a daughter. Of all theastronauts bound for Hubble, veteran spaceflyer Michael ?Mas? Massimino is theonly one broadcasting his mission training to the world under the moniker@Astro_Mike on the microblogging Web site Twitter. ?Thewhole Twitter experience has been great fun,? Massimino, 46, told reporterslast month. ?I think as astronauts we look for ways to be able to share what wedo because it?s a pretty cool job.? As ofMonday he was: ?Enjoying my weekend, last one beforeentering quarantine, 8 days to launch.? Like Grunsfeld, Massimino is a veteran spacewalker andHubble handyman. He, Grunsfeld and Altman all flew together on the STS-109mission. Massimino holds a doctorate in mechanical engineering and joinedNASA?s spaceflying ranks in 1996. He is making his second spaceflight onAtlantis, where he serves as Mission Specialist 4 and will perform twospacewalks. Massimino grew up in Franklin Square, N.Y., and is marriedto wife Carole. They have a teenage daughter and son. Rounding out Atlantis? Hubble servicing crew is first-time flyer Andrew Feustel,who will perform three spacewalks during the mission as Mission Specialist 5. ?It isaction-packed,? Feustel, 43, told SPACE.com. ?It?s going to be busy,there?s no question.? Feustelgrew up in Lake Orion, Mich., and is married to wife Indira and has two sons,ages 13 and 15. He joined NASA?s astronaut ranks in 2000 and is a trainedgeophysicist with a doctorate in geological sciences and a specialization inseismology. In 2006, he spent six days living on the ocean floor in theundersea laboratory Aquarius as part of NASA?s NEEMO 10 mission to test newspacesuit concepts. But while Feustel does hope to spot the signals of Earth?splate tectonics from space, his heart is set on walking and working inweightlessness. ?Doing aspacewalk is something I?ve always wanted to do, so I?m really excited aboutit," Feustel said. ?I want to have a good time and enjoy it while I?m upthere. ?